"Emily Trefusis and Charles Enderby were seated at a small table in Deller's Cafe in Exeter. It was half past three and at that hour there was comparative peace and quiet. A few people were having a quiet cup of tea, but the restaurant on the whole was deserted". The author is Agatha Christie and the book is 'The Sittaford Mystery' from chapter 25 entitled 'At Deller's Cafe'. 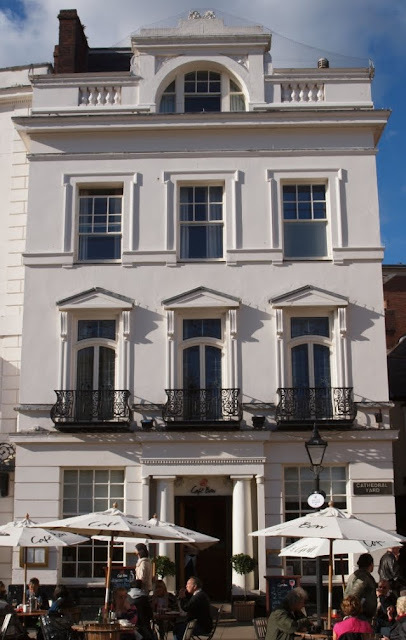 Christie was a regular visitor to Exeter and the eponymous restaurant from chapter 25 was to become one of Exeter's most important 20th century buildings and one of its most popular. Deller's was established in 1844 by the grocer Edwin Deller at Paignton, a small coastal town about 20 miles from the city, but the first Deller's cafe in Exeter didn't open until 1905. 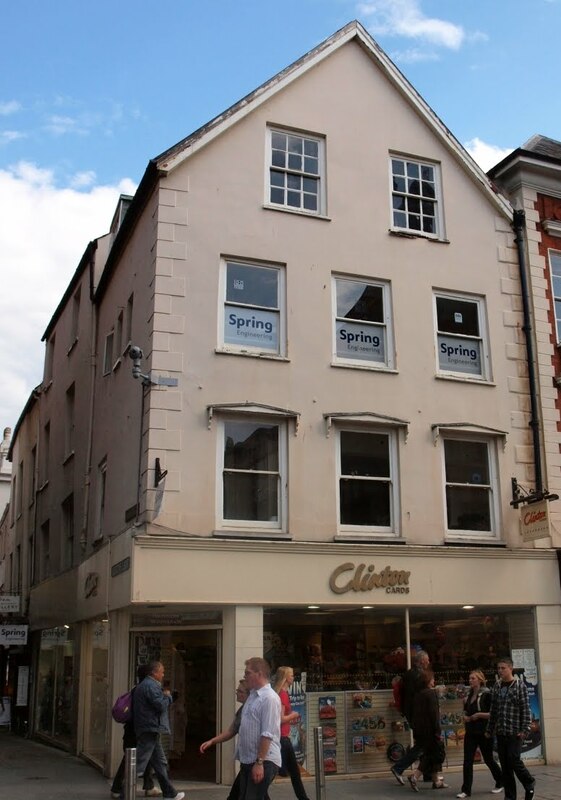 The building it originally occupied in the city was on the corner of St Martin's Lane and the Cathedral Yard, in the beautiful 18th century property that had been the first premises of the Exeter Bank (now the Michael Caines restaurant right). But within 10 years the firm was looking to expand into larger premises and a site just off the High Street had recently become available. In 1912 the sprawling 17th century Half Moon inn had been demolished. 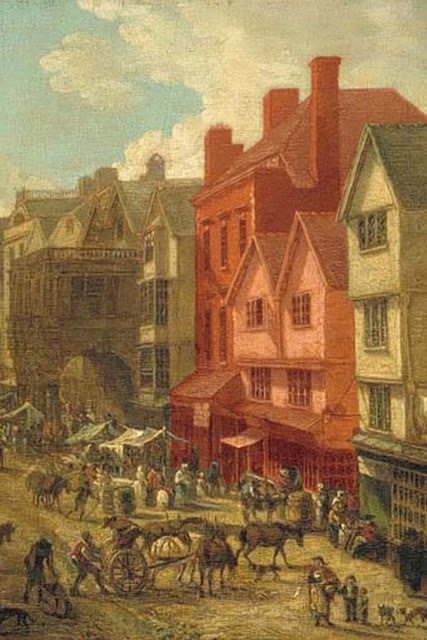 The inn had occupied a large area on the corner of the High Street and Bedford Street, running all the way back to Catherine Street at the rear. The entrance into Bedford Street from the High Street was narrower than it is today and, prior to 1942, it opened out dramatically into the Georgian townhouses of Bedford Circus. Following the demolition of the Half Moon inn only part of the site was reused when a mostly single-storey structure was erected for Lloyds Bank on the corner of the High Street and Bedford Street. Deller's in Exeter saw its chance both to expand and to move into the commercial centre of the city. The architects decided to take advantage of the single-storey Lloyds Bank building in Exeter by constructing the cafe both on top of the bank as well as on the open area left unoccupied towards Catherine Street at the rear. It was therefore possible to provide a ground floor main entrance into the cafe from Bedford Street as well as using all of the space above the bank that overlooked the High Street. The building was a remarkable mixture of architectural styles. The exterior walls were built of red brick studded with a riot of large and small mullioned windows with dressed stone surrounds that evoked a sort of Jacobean revival complimented by the Dutch gables on the Bedford Street elevation and the single pointed gable on the High Street elevation. 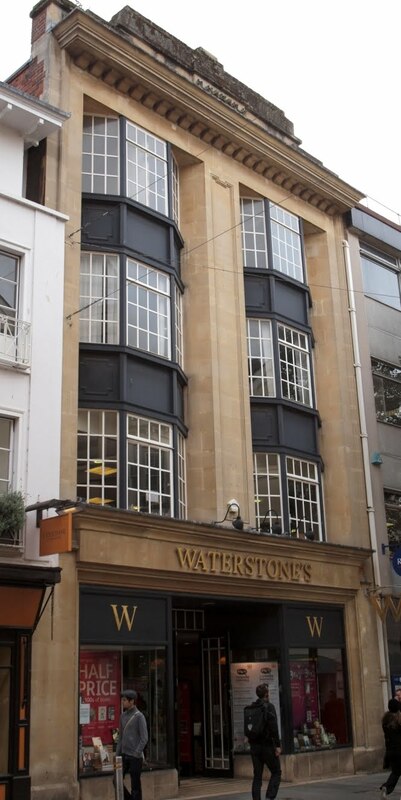 At first floor level, rounding the corner from the High Street into Bedford Street, was an enormous 21-light window framed by stone pilasters and surmounted by a lead-roofed dome decorated with wreathes. The main entrance in Bedford Street consisted of a gigantic Baroque scrolled pediment beneath which lounged two sculpted female figures with columns on either side. The photograph above © Express & Echo shows Deller's Cafe after the interior was damaged by fire in 1942. The walls up to roof height remained intact. The entrance from Bedford Street is on the left. 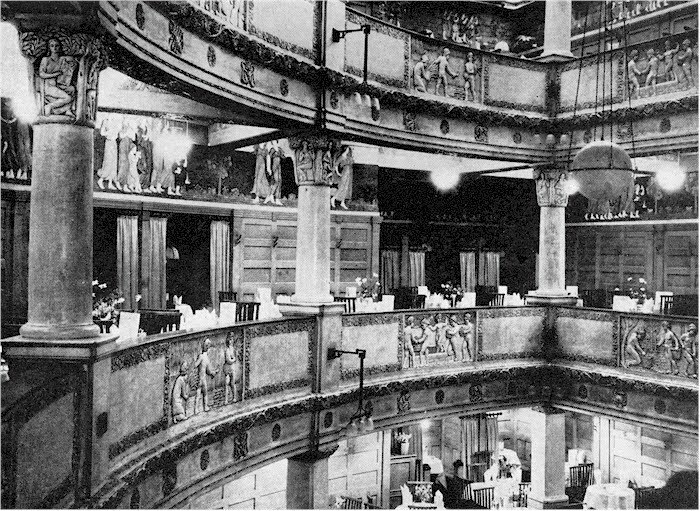 The two Ionic columns to the far right overlooked the High Street and were part of the Lloyds Bank building on top of which much of the cafe was located. It was all demolished by the city council after the war. 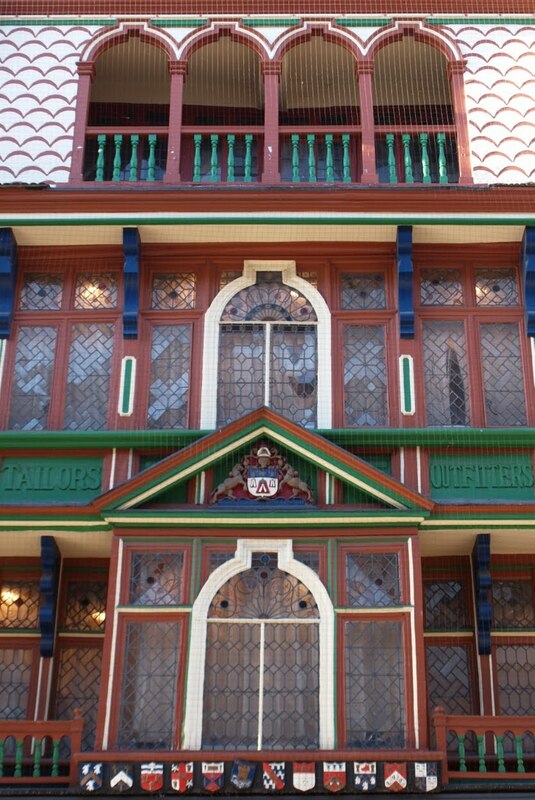 But it was the interior that made Deller's such a renowned building. The main entrance led into a spectacular atrium that rose the full height of the building and which was lit from above through a glass roof (part of the atrium is shown in the postcard above and at the top of this post). Around the edges of the room were first and second floor balconies accessed from the ground floor via a wide oak staircase. Oak panelling clad the walls. Inset into the walls of the balconies were plaster reliefs of frolicking Rococo cherubs, each tiered gallery supported by columns whose capitals were decorated with instrument-playing female figures. Above the oak panelling ran a continuous sculpted frieze with diaphanous, robed figures interspersed with stylised trees, borrowing freely from both the pre-Raphaelites and the Art Nouveau movement, the frieze itself brightly painted in greens, reds, mauves and blues. The overall impression was one of sumptuous luxury and lavish ornamentation. From these galleries it was possible to see everything that happened in the cafe while a string quartet played from the floor below. And there were other rooms, like the huge ballroom above with a sprung floor. The ballroom also had another coloured frieze and an ornate plasterwork ceiling divided into sections by intricately decorated ribs, and there was yet another large dining room with timber-framed panelling on the walls. 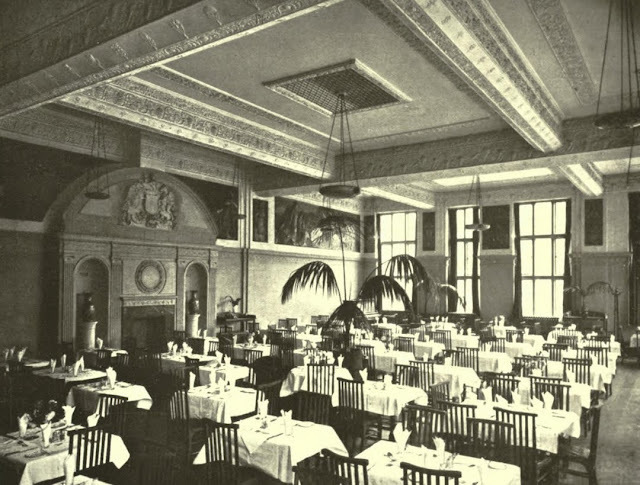 The sculpted reliefs were by Arthur Glover, the paintwork was executed by James Williams and the plasterwork ceilings were created and installed by Jackson & Sons of London. It was a remarkable building, not just unique in Exeter but possibly unique in the entire country. There was nothing else quite like it. 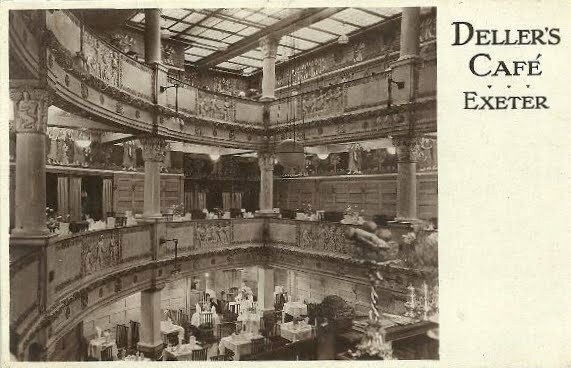 In December 1916 Deller's in Bedford Street opened for business and between then and its demise in 1942 it gained a reputation as one of the finest cafes in England. As a building it featured in numerous architectural periodicals and journals throughout the 1920s and 1930s and had it survived into the 21st century it would've been one of the most notable early-20th century structures in the west of England on the strength of its interiors alone. 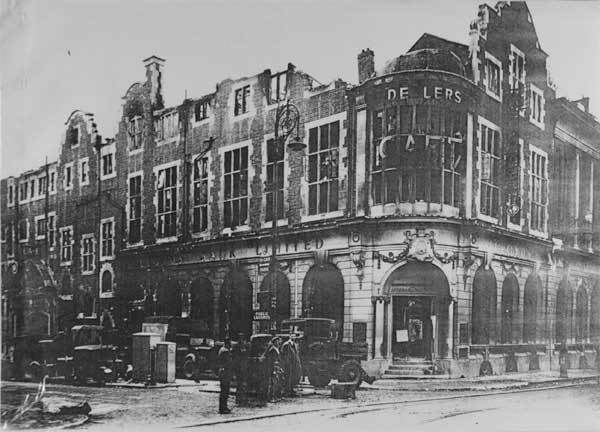 On 04 May 1942 Exeter was blitzed and the entire building was ignited from flaming debris as the High Street burned. By the following morning Deller's Cafe had been severely damaged by fire. As Peter Thomas states in his book 'Aspects of Exeter', "in spite of the roof and the floors having collapsed, there was enough left of this gabled brick building...to warrant preservation and rebuilding". It should be said that not all of the interior was destroyed. I've seen photos taken after the fire which prove that some significant portions of the interior decoration remained intact, including much of the ballroom with its plaster ceiling and coloured frieze. But, as with so many of Exeter's war-damaged structures, instead of reconstruction Deller's Cafe was "completely destroyed as a result of official policy" (Peter Thomas, 'Aspects of Exeter'). The city council swiftly authorised the total demolition of the remains. 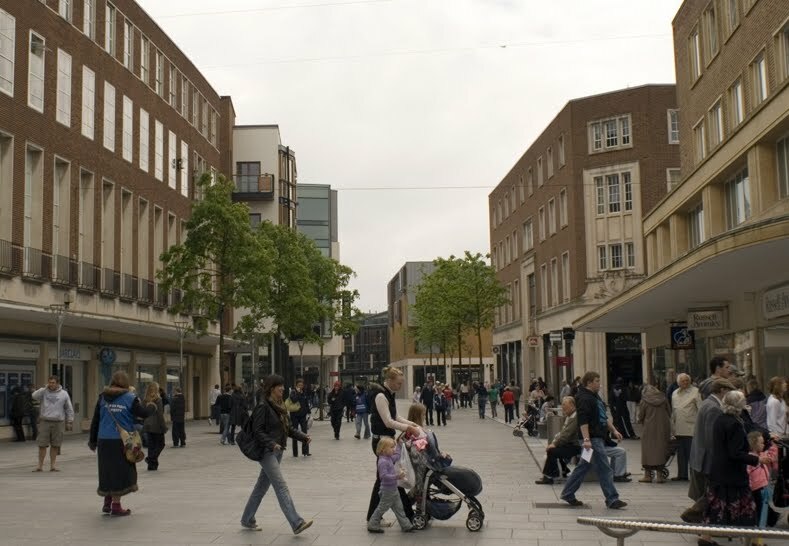 Bedford Street was widened and the original site of Deller's Cafe is now an open, pedestrianised area above. 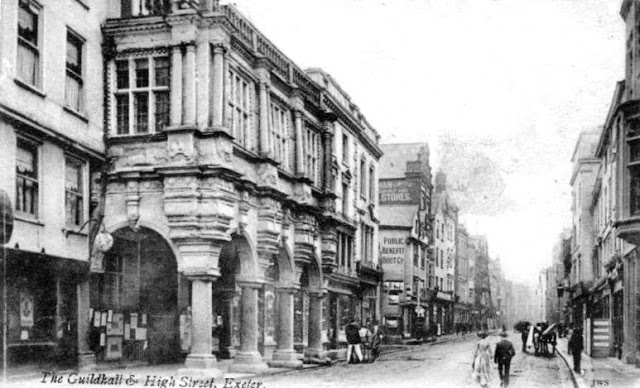 The loss of Deller's, a popular social meeting point, was a real blow to the citizens of Exeter. 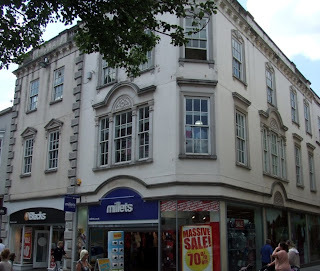 I've talked to several people who remember the pre-war city and they all cited Deller's as one of Exeter's most wonderful buildings and its presence is still missed even by those who never saw it. "Probably the best preserved group of late medieval houses in Exeter"
The quote comes from the city council's own 2002 conservation report for central Exeter and it's difficult to argue with the sentiment, even it does stretch the definition of 'medieval' to breaking point and beyond (the "best preserved group" of genuinely medieval houses is unquestionably in the Cathedral Close). 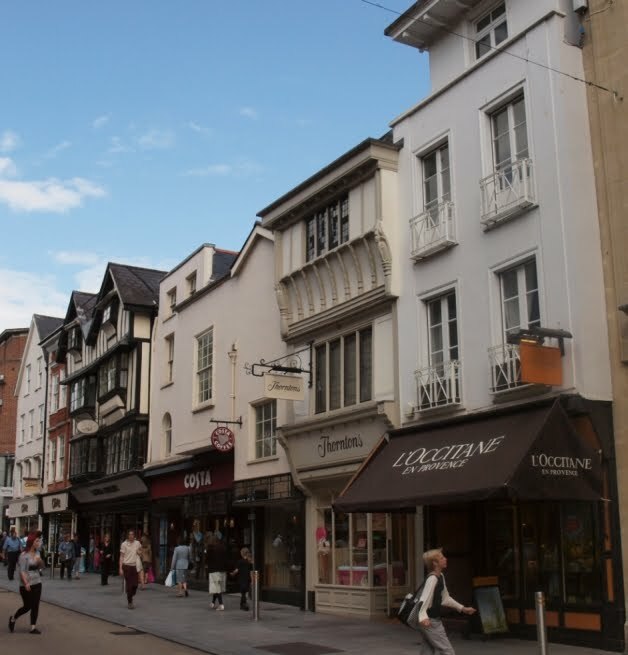 In fact what we have in the High Street are eight properties, all with timber-frame cores, some of which date back to the first half of the 16th century and only two of which have retained their original street elevations (counting the pair at Nos. 41 and 42 as a single entity). The only genuinely medieval fabric is probably the cellar walls of Nos. 41 and 42 which could be the remains of the security wall built around the cathedral precinct in the late-13th century. The wonderful photograph above © Petehem was taken from the top of the Marks and Spencer building on the corner with the High Street and Queen Street and captures like few others the atmosphere and visual appearance of the pre-war city. It's one of the relatively few areas of the city centre where you can point a camera and capture a wide urban landscape without seeing post-war intrusions. No. 40, Nos. 41 and 42, and No. 46 all have Grade II* listed status. The rest are Grade II. This tiny group is about as good as 16th and 17th century domestic architecture gets in Exeter. It's unfortunate that until relatively recently much of the city looked like this but now there are only a few paltry fragments left to suggest the importance of the city in the time of the Tudor or the Stuart monarchs. 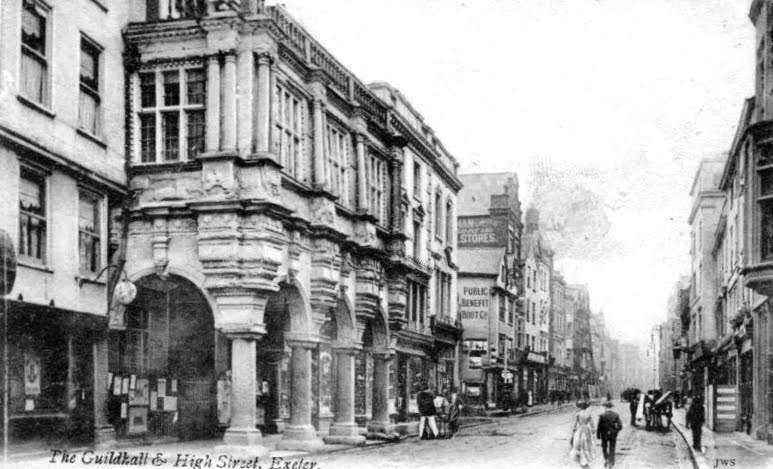 When the notable architect and Georgian specialist Sir A. E. Richardson visited Exeter in 1920 he correctly stated that "many sturdy relics of the past have been buried alive, and a fair proportion of houses belonging to the Tudor period still await investigation." Unfortunately the further investigation never occurred and many of the buildings were destroyed, unrecorded, during the Blitz of 1942. Nos. 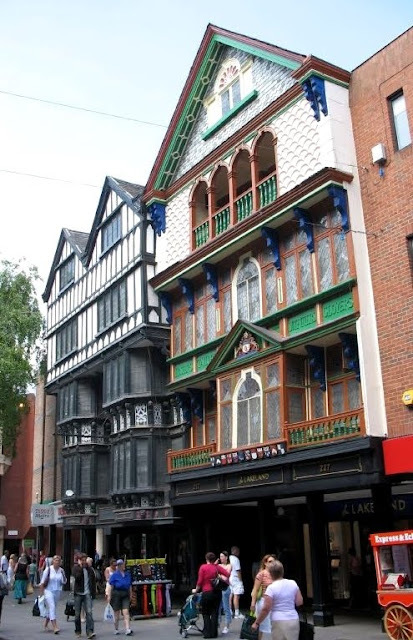 43, 44 and 45 High Street all date to the 1500s and are some of the oldest houses still surviving in Exeter. The first point of interest are the very narrow plots which each building occupies, especially that of No. 45, which is just over 9ft (3m) wide. Many of these narrow strips of land are the remains of medieval burgage plots and it's likely that there have been buildings of some sort on exactly the same footprint for perhaps one thousand years. At the beginning of the 20th century many of the buildings in the city centre still respected this ancient division of land. Now it is something of a rarity. The facade of No. 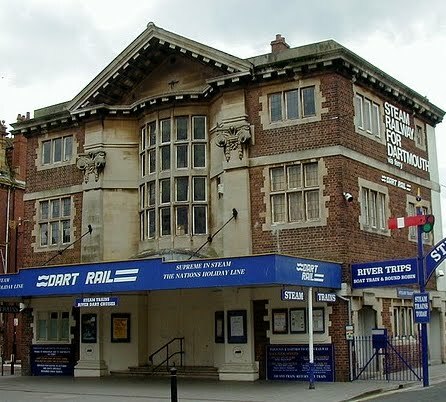 43 (to the far left in the photograph above) is early-19th century with attractive sash windows on the second and third floors, the roof hidden behind the third floor parapet. The round-headed windows on the first floor are a nice touch but it's all a rather poor substitute for the original timber-framed frontage. No. 44 right is also a mid-16th century timber-frame building and it's likely that it was built as a pair with No. 43 (much like Nos. 41 & 42 and Nos. 46 & 47). In the 18th or 19th century the front was ripped off and replaced with what is little more than a square of rendering with a sash window stuck into the middle of it. Until the beginning of the 20th century this bleak facade was capped with a low pediment which has now disappeared. The building is only two-storeys high. It's possible that it was originally built with more floors but, if so, these were removed a long time ago. 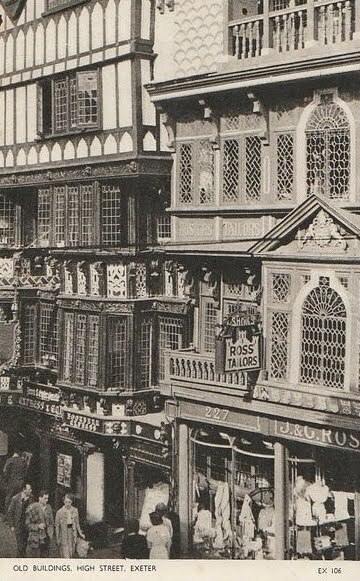 The most interesting aspect of the exterior is how the first floor facade jetties out slightly over the High Street, a faint echo of its Tudor forebear. The frontage of No. 45 (to the far right in the photograph top) is even worse! From the outside it must rank as one of the most forgettable exteriors in the entire city. It looks like a three-storey garden shed. The late-Elizabethan facade was also replaced, probably in the 19th century, and was modified again in the 20th century when a second floor window was blocked up and the current gable installed. The first floor also slightly overhangs the street below. It is slightly later than the other buildings surrounding it, dating to c1600. Inside there are moulded oak beams on the first floor which at least suggest the building's ancestry. 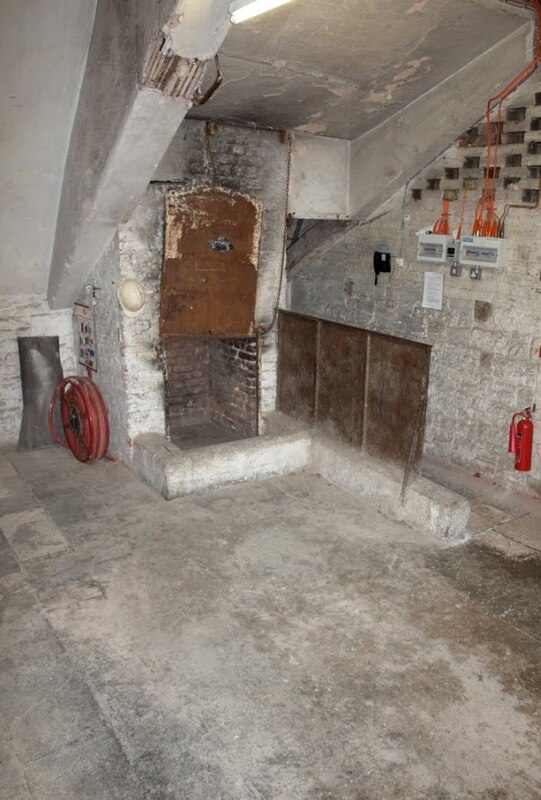 There is also a cellar, lined with Heavitree stone, with the remains of steps that once led up into the High Street. 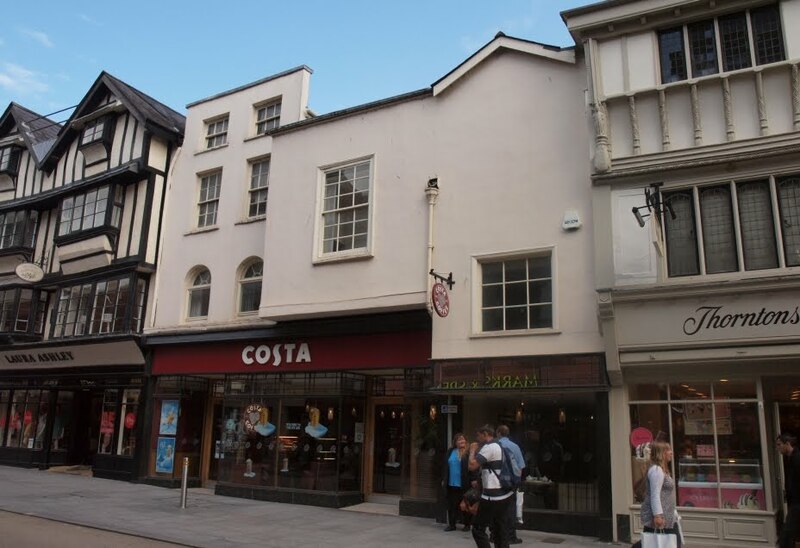 It's also likely that when first constructed it didn't replace an earlier building as it occupies a portion of Lamb Alley which led past the side of No. 46 and into the Cathedral Close. The properties are unfortunate in as much as they are sandwiched between two genuine, if much-restored 16th century facades which only serve to emphasise the loss of the original elevations (below), one of which is the lovely Nos. 41 and 42. Still, apart from a handful of notable exceptions this tiny group is about as good as surviving timber-framed Tudor domestic architecture gets in Exeter now. All three buildings are Grade II listed. Having walked above the entire length of the cathedral's main vault visitors return to the area above the crossing, the point where the transepts join the choir and nave. A doorway leads into the roof space above the aisle that connects the main body of the church with the transeptal South Tower, the location of what was once the cathedral's lead workshop left. Since its construction, the cathedral has always consumed a vast quantity of lead. 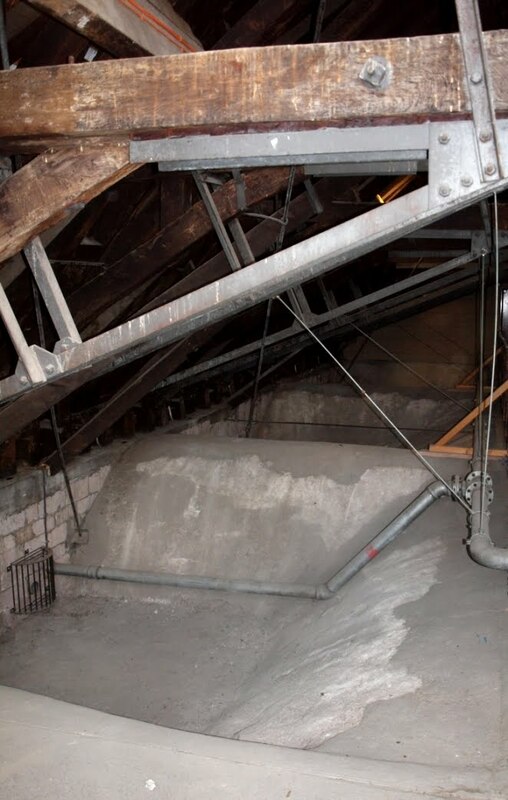 The current roof has about 450 tonnes of lead on it, a colossal amount even in the 21st century. 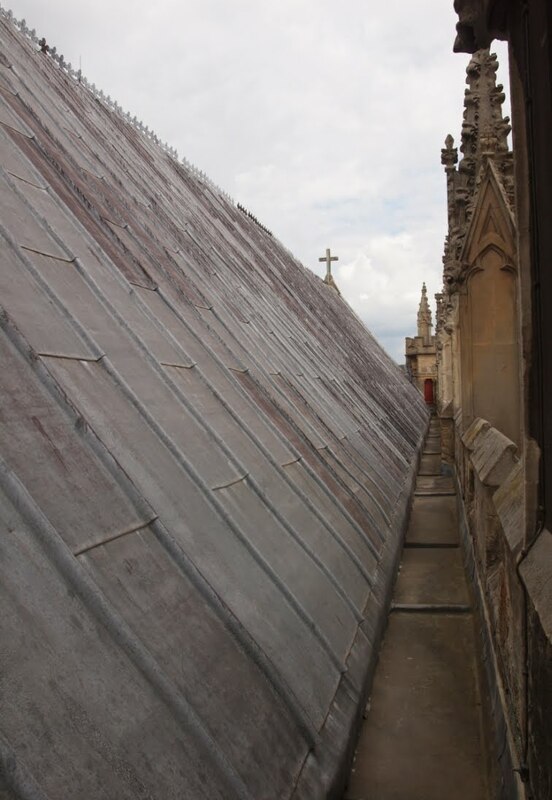 In the 14th century it seems that the cathedral authorities sourced lead from a number of places. The Fabric Roll for 1302 records that a large stock of lead was purchased at St Botolph's fair in Boston, Lincolnshire, over 200 miles away from Exeter. Another consignment entered England at Dartmouth in 1325, possibly sourced from the continent and shipped over the English Channel. Lead ore was also purchased. The ore was brought up to the lead workshop where it was smelted down in a furnace. The molten lead was then poured out onto the stone floor where it was beaten and rolled into flat sheets. The lead workshop continued to be used up until the early years of the 20th century and the flue for the furnace is still visible jutting out from the roof of the south transept. The photograph right shows the view towards the eastern end of the cathedral, the steep, leaded roof of the choir on the left. This walkway is accessible via a narrow door off the workshop itself. A flight of stone steps takes visitors from the lead workshop up into the South Tower, one of two which remain from the original Romanesque building. Both towers contain bells. The North Tower holds a single bell called the 'Peter' bell (the cathedral is dedicated to St Peter), but the South Tower has a total of 14 which together, at 14 tonnes, constitute the second heaviest peal of bells in the world (the heaviest being at the 20th century Anglican cathedral in Liverpool). The heaviest bell in the South Tower, weighing over 3.5 tonnes, is called the 'Grandisson', named after the bishop who was in office when the cathedral was completed in the mid-14th century. It was recast in bronze from an older bell in 1902. Although the oldest current bell was cast in Exeter in 1616 many of them use material from medieval bells, some of which were probably installed in the Norman cathedral when it was completed c1180. All of the bells, including the massive 'Grandisson', can be swung in a full circle rather than simply from side to side, as happens in most other countries. The cathedral bells are fascinating and deserve their own post on this blog at a later date. The 14 bells in the South Tower are located two floors above the ringing chamber but unfortunately it's not possible for visitors to view them. The photograph above left shows the bell-ringing chamber high up in the South Tower. The two blocked openings in the wall on the left have the distinctive round-headed arches of the Romanesque style and were two of the tower's original 12th century windows. 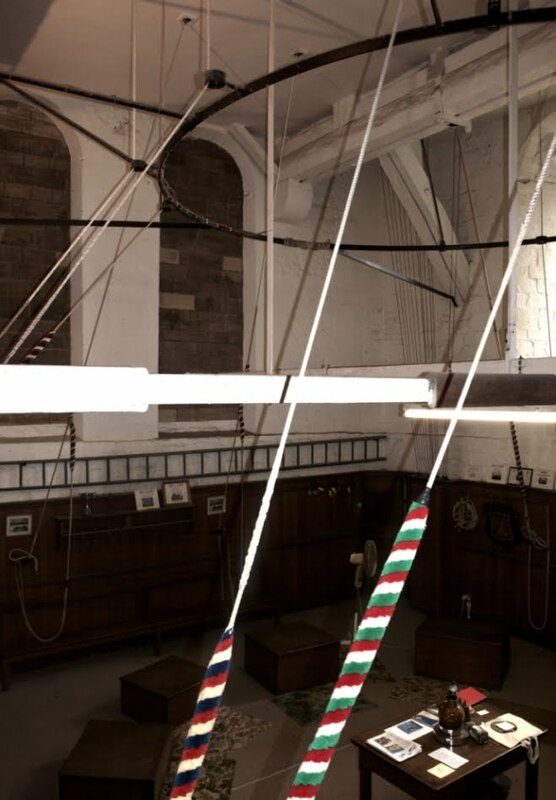 The large metal hoop near the ceiling is designed to hold the ropes apart to prevent them from getting tangled together. Access to the bells is via a spiral staircase set into a corner of the chamber. Having returned through the lead workshop and back to the crossing above the main vault the visitor passes into the North Tower. 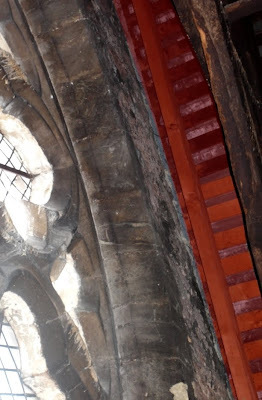 Access into the upper levels of the tower is through what was once one of the windows of the Norman tower prior to the 14th century remodelling of the cathedral and leads into the equivalent of the bell-ringing chamber in the South Tower. The timber roof of this large chamber is black with age and contains some of the most gigantic oak beams in the entire building. The walls are just rough-hewn stone, the atmosphere redolent of a castle keep. 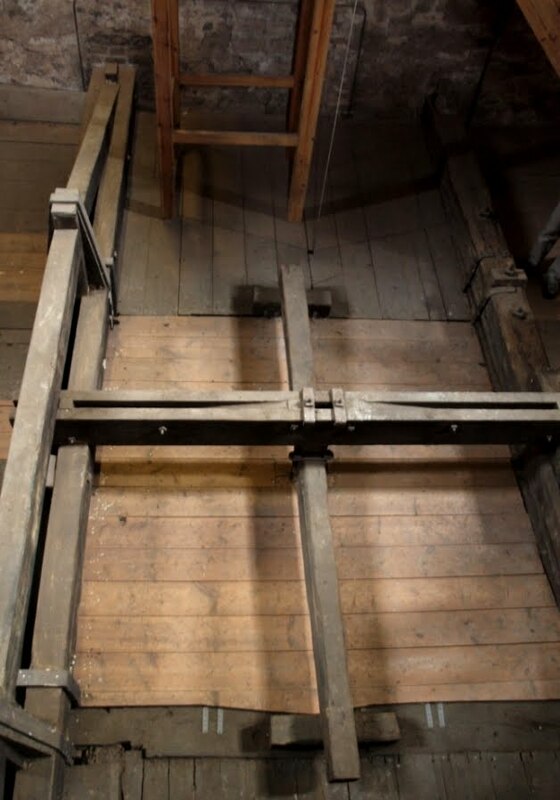 One interesting feature is a colossal trap door right, approximately 10ft (3 metres) in diameter, set into the floor through which bells were once transported via the wooden vault in the north transept and up into the belfry at the top of the tower. Also in this room is the striking mechanism for the 'Peter' bell. The 'Peter' bell weighs around 5 tonnes and was recast on the orders of Bishop Courtenay in 1484 as a replacement for an earlier bell. Over-excited celebrations at the failure of the Gunpowder Plot in 1606 caused it to crack and it was recast in 1676 by Thomas Purdue. The 'Peter' bell is essentially a clock bell, striking the hours using a hammer falling against its side. 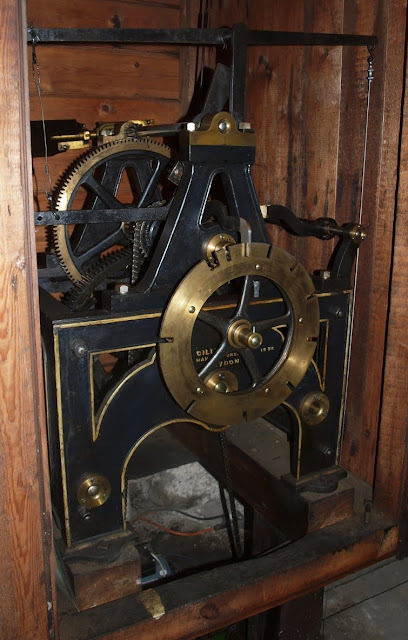 A clock with a bell has been in the cathedral since at least 1327 but in 1885 the striking mechanism was replaced with the current mechanism left. The clock movement itself is located in a room further down the tower. The striking mechanism was formerly wound by hand but an electric motor has been used since 1970. The 'Peter' bell still tolls every hour and its sombre tone can often be heard across the city. From this chamber another spiral staircase takes the visitor up onto the roof of the North Tower itself. Each tower is approximately 150ft (44 metres) high, and the impression of height is remarkable after emerging from the confined interior of the roof spaces. And here we are on top of the cathedral. 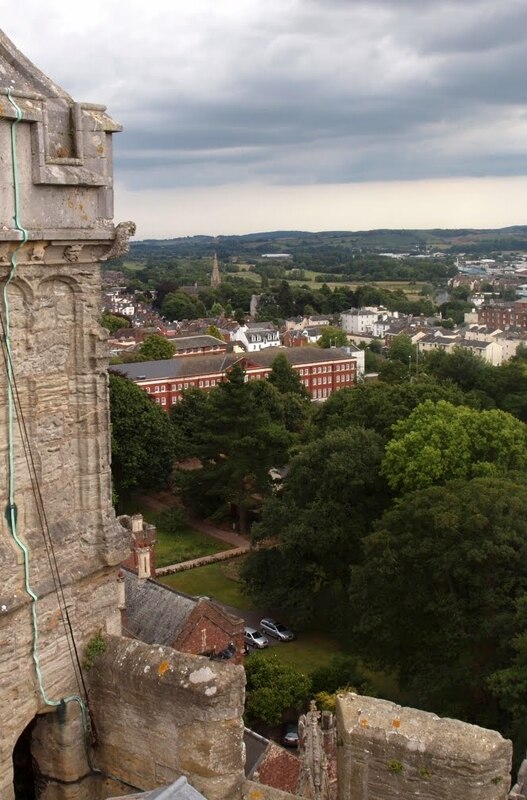 The views across Exeter are panoramic and it's possible to appreciate the city's beautiful geographical location, sitting in a bowl with the cathedral in the centre and surrounded on nearly all sides with the rolling green hills of Devon, the estuary of the River Exe a silver ribbon in the far distance. The photograph above right was taken from the top of the North Tower and shows the eastern end of the cathedral looking over the copper beeches in the grounds of the Bishop's Palace, over the backs of the remaining Georgian terraces in Southernhay West and out towards the suburb of St Leonard's. The flying buttesses that support the vaulted ceiling and the roof, and the tall clerestory windows, are all clearly visible. The Norman builders shared a similar view over the area nearly 900 years ago and the sheer scale of the towers' construction makes their achievement even more remarkable. It's difficult to imagine the mighty impression of political, social and religious power that the original Romanesque building must've made on the Anglo-Saxon population as it arose stone by stone over a city that had once rebelled against the Conqueror himself. Nothing remotely on the scale of these two towers had ever been seen in Exeter before. From here the guided tour returns back the way it came to the floor of the nave in the cathedral's south-west corner. The tour is exceptionally interesting and can be highly recommended for anyone either visiting the city or living here. The photograph below shows the view towards the trees of Rougemont and the university buildings scattered upon the far hills, with some of the few remaining fragments of the pre-war city clinging to the edge of the Cathedral Close, the brick wasteland of the post-war reconstruction beyond. Queen Street is visible to the far left with Mol's Coffee House in the centre foreground. The ruins of the medieval St Catherine Almshouses and the Canonry in Catherine Street can just be seen to the right. 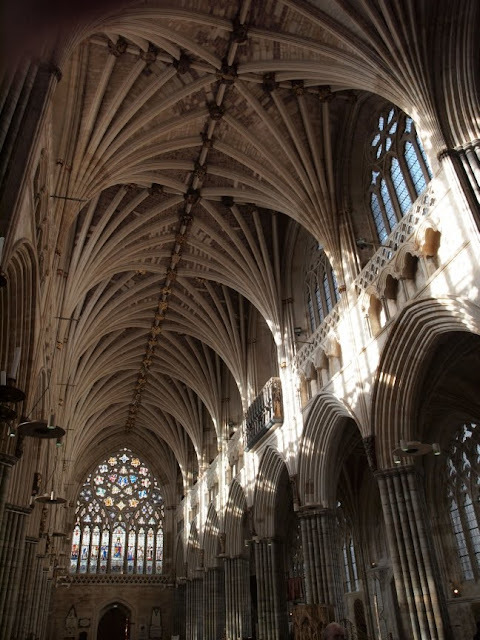 The main vault inside Exeter Cathedral is not only the longest stretch of uninterrupted Gothic vaulting in the world but also crowns one of the most beautiful medieval interiors in Europe. In the words of the great architectural historian, Sir Nicholas Pevsner, "the luxuriant palm-branch effect is unforgettable". 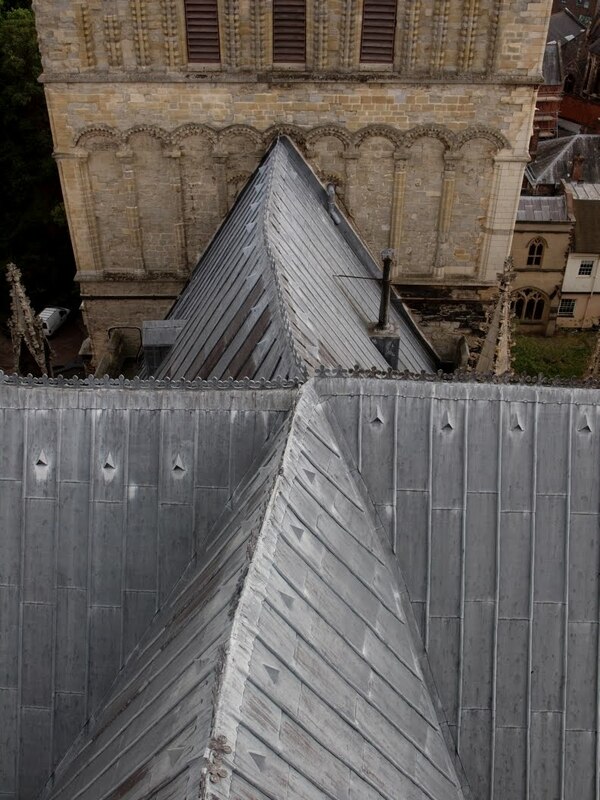 During the summer months the cathedral runs guided tours into the roof space that gives visitors the opportunity to walk through the void above the vault as well as providing access to the top of the 12th century North Tower. The tour begins in the south-west corner where a very narrow spiral staircase rises through the building from ground level via a short passageway over the aisle to the roof space above the vault. 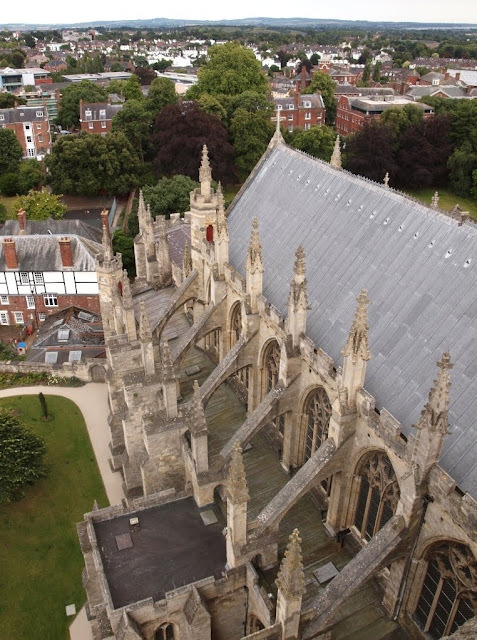 Following the destructive fire in the south transept of York Minster in 1984 the Dean and Chapter at Exeter decided to install some significant fire prevention measures throughout the cathedral, including very sensitive computer-monitored smoke sensors in the roof space and water spray extinguishing systems. Another addition was the division of the roof space above the main vault into five separate compartments using firewalls fitted with fire doors. Prior to this installation there was a continuous view of the top of the vault from the west end to the east end but unfortunately this is now no longer possible. (Despite these measures insurance for the building still costs around £250,000 a year.) The photograph right shows part of the roof space and the rose window that sits high up in the gable at the eastern end of the cathedral. The central walkway literally runs on top of the middle of the vault and was installed to help firefighters move around the roof in the event of a fire. The humps and hollows to the right mirror the contours of the tierceron vaulting beneath. The floor of the cathedral is 68ft (21m) below. The vaulting, and the roof that covers it, all date to between c1275 and c1335, a period of around 60 years that saw the cathedral's nave and choir rebuilt almost entirely in the Decorated Gothic style. Apart from the vaulting in the transepts, all of the vaults in the cathedral are made of stone. Exeter Cathedral underwent an extensive restoration, beginning in 1870, under the leadership of Sir George Gilbert Scott. At some point in the last quarter of the 19th century, the Victorians hit upon the ridiculous idea of coating the top of the vaulting in concrete, allegedly in order to strengthen the stone work. The concrete was applied across the top of the entire vault to a depth of around four inches (11 cms). This could yet prove to be a disaster. Not only did the concrete cover up the original rough-hewn medieval stonework but it also added an enormous extra weight to the vault itself. Over the last century there have been signs of the supporting columns of Purbeck marble in the nave and choir starting to flake with the added stress of the concrete. At the moment it is simply impossible to remove the concrete without endangering the entire structure. The photograph left clearly shows the concrete-covered vaulting. 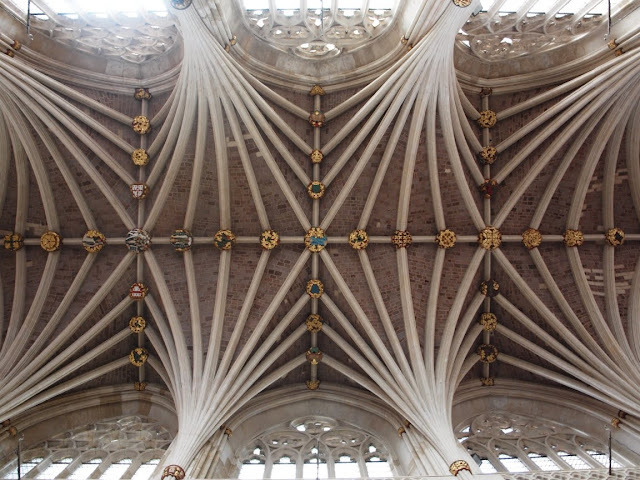 The total thickness of the vaulting, including the concrete, is only around 9 inches (22cms). The pipework is part of the water sprinkler system, the idea being that the water can pool in the hollows and then run out of the building via the small grated hole set into the wall to the far left. Also visible are the steel supporting brackets that were installed throughout the roof space in the 1920s. Most of the 14th century timber structure of the roof itself has survived relatively intact. The roof is constructed around a basic A-frame design. Rafters resting on the top of the walls rise diagonally to meet in the centre at the ridge beam. Purlins run parallel with the ridge beam the full length of the building and the rafters are tied together across the width with tie beams, the tie beams supported in turn by curved braces. Above the tie beams are a further set of smaller beams called collars and resting in the centre of the tie beams, connected to the collars, are king posts which help to prevent the tie beams from sagging. The cathedral's archive contains one of the most complete sets of medieval records in the world. These are the so-called Fabric Rolls. Written on vellum, the rolls recorded in minute detail the costs of rebuilding and maintaining the cathedral, the fabric of the building, and cover an almost uninterrupted span between 1279 and 1514. The Fabric Rolls show that most of the timber for the roof came from English oaks which were sourced from various woods in Devon. There were oak forests that belonged to the Exeter diocese at Newton St Cyres and Chudleigh, and there the oak was matured beneath water at the water mills before being transported into the city. Lustleigh, Canonteign and Langford were just some of the other places that supplied oak trees for the cathedral's rebuilding. The trees must've been vast when felled as some of the beams are enormous and only the inner heartwood was strong enough for construction purposes. The English oaks from which the beams came would've begun as acorns germinating on the floor of a Saxon forest in Devonshire during the 6th or 7th centuries AD. Dendrochronological testing on some of the wood above the crossing has returned a felling date of 1306. No-one knows when it started exactly, but slowly the roof began to move, a process known as racking. 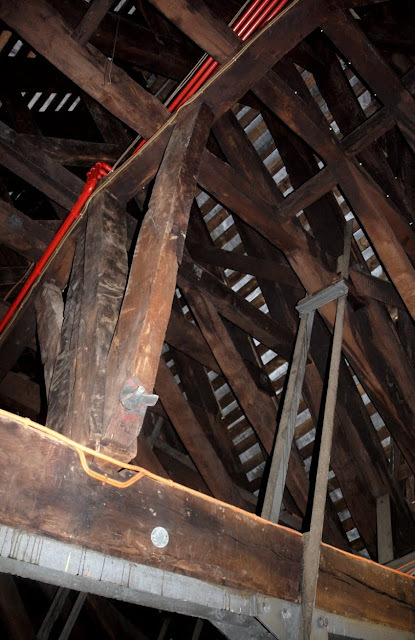 It's possible that the culprit was a missing purlin at the east end (the corbel on which it rested is now empty) removed probably in the 18th century because it was rotten and its structural importance overlooked, but the entire timber-frame structure started to drag itself out of vertical. Like dominoes being knocked over, the top of each A-frame shifted westwards. The pressure gradually built up on the stone gable end of the West Front and started to shove the gable outwards. It is currently 19 inches (50 cms) out of vertical although the movement has been stopped through the use of the steel brackets under the tie beams. The photograph above left was taken at the east end. The vertical beam on the right was originally adjacent to the stone wall, the gap which has opened up through the movement of the roof is highlighted in red. The extent of the racking of the A-frames was much more extreme in the timbers located towards the middle of the building and many of them are now an incredible 6ft (2 metres) out of vertical. This is nowhere more apparent than from the top of the transept towers, looking down onto the crossing, where the transepts meet the nave and choir. The photograph above right, taken from the North Tower, shows how the roof over the choir and the nave has moved, dragging both roofs of the transepts with it. 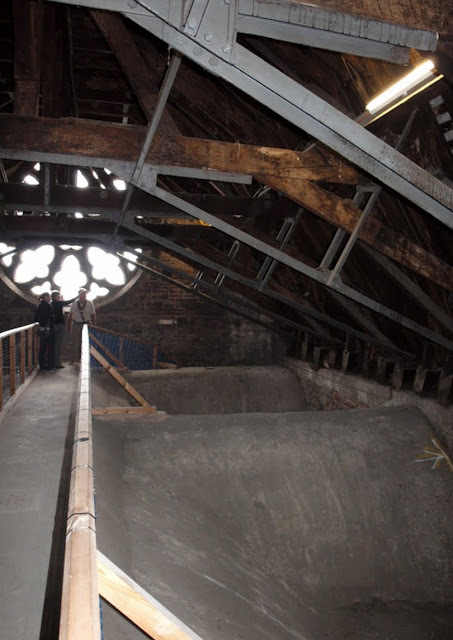 Other areas of the cathedral are also covered by the roof tour, including the roof spaces above both transepts, the lead workshop and the bell-ringing chamber before moving to the top of the North Tower. These are covered in part two of this post. The photograph below, taken in the nave, shows just one small section of the extraordinarily beautiful vaulting. Situated between No. 40 and the corner of St Martin's Lane, which runs down from the High Street into the Cathedral Close, No. 39 presents another unprepossessing rendered facade fitted with modern sash windows, but once again the facade conceals a late-17th century timber-frame building, probably built at the same time as No. 40. The only point of interest externally are the rusticated quoins, now heavily disguised by multiple coats of paint. It's unlikely that any features survive inside but the property was granted Grade II listed status in 1974. The modern shop front is an exceptionally poor addition. No. 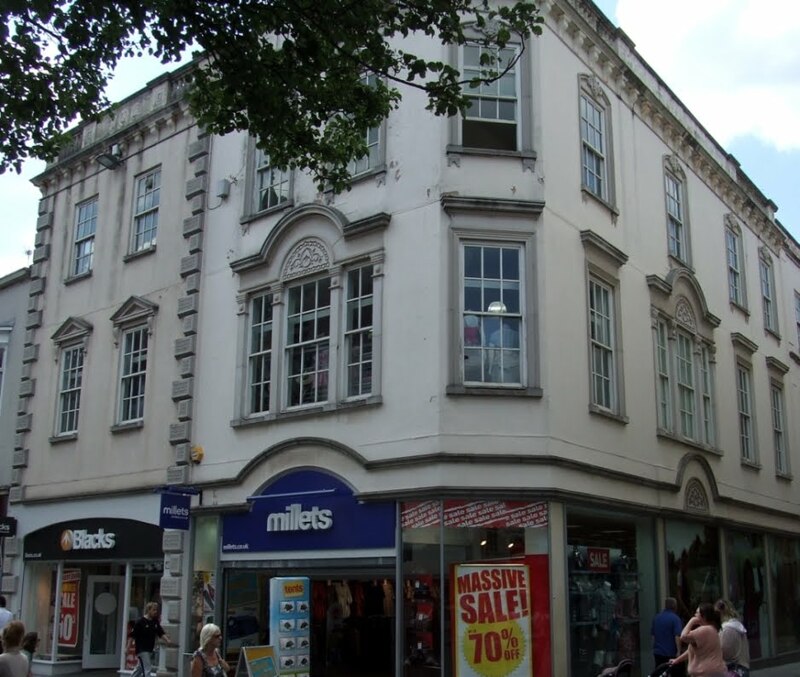 40, High Street is one of the prettiest and most unusual buildings in Exeter despite the fact that the ground floor has been trashed by the inclusion of modern retail space. The facade conceals an older timber-framed building which probably dates to the mid-17th century, but the orange-red brick elevation which overlooks the High Street dates to c1700 making it one of the earliest surviving brick constructions within the city. The red-brick Custom House on the Quay is about 20 years earlier in date as is the facade of No. 5 and the whole of the Notaries' House, both in the Cathedral Close. An even earlier brick building, the first known example of its type in the city, was the vast house constructed for the Exeter merchant John Matthews in 1659 just outside the South Gate. Although the facade was replaced in the early 19th century the property survived until it was demolished by the city council in 1977 as part of the inner bypass development. Other examples were the remarkable Paragon House near South Street (destroyed in 1942) and the exceptionally fine Pinbrook House near Pinhoe of 1679. The six 12-light sash windows of No. 40 are an addition from the late 18th century. The quoins and deeply-moulded ovolo cornice are all made of stone as are the small lengths of cornice over the windows that function as pediments. The semi-circular pediment over the central window on the third floor is a very attractive touch. The central windows also have fine ogee-shaped heads above the window frames. The hipped slate roof is barely visible from the street. The photograph right c1900 shows No. 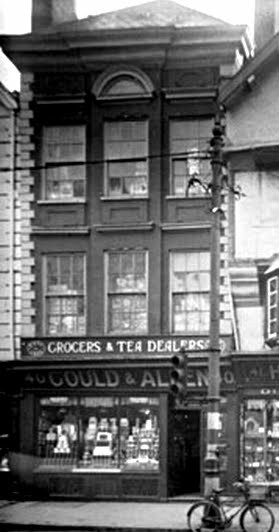 40 with its late-19th century shop front when it was used by the firm Gould & Allen to sell tea and groceries. The bricks are exceptionally small and are laid in a Flemish bond pattern. Decorative brickwork panels appear above and below the third floor windows and the central bay protrudes slightly from the rest of the elevation. As Hugh Meller states, the facade is "full of subtleties and elaborations". It's like a little Queen Anne mansion in miniature, and when new the facade would've been unlike most other buildings in Exeter, the vast majority of which were still timber-framed with gable ends and multiple storeys jettying out over the street (similar in fact to the neighbouring house, Nos. 41 and 42). Like other timber-framed buildings in the city, No. 40 originally consisted of a front block and a rear block, joined across a courtyard in the middle by a gallery. The courtyard has been glass over and the back block has been totally rebuilt. You would expect such a property to have a shallow tread staircase with plain oak panelling and tasteful plasterwork ceilings, but according to the listing description there are "no visible internal features" of interest. It's a great shame that nothing appears to survive inside but as a whole No. 40 is fully deserving of its Grade II* listed status. The single structure that comprises Nos. 48 and 49 on the High Street is easily my favourite 20th century building still surviving in Exeter, a highly innovative mix of various architectural styles which somehow manages to emerge as a success in its own right. Unfortunately, I know almost nothing about it. The building isn't listed, even at a local level, but it ought to be as it far outshines nearly all of its 20th century companions, particularly those built after 1945. The year 1922 allegedly appears in Roman numerals on a date stone set high up on the parapet so presumably this is when the building was constructed (the parapet itself is indisputably Art Deco in style). Standing almost opposite the narrow entrance into Goldsmith Street, Nos. 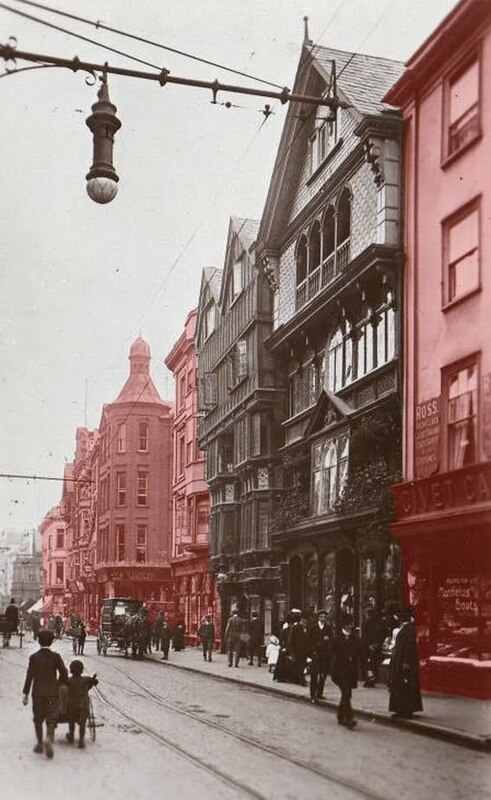 48 and 49 was built to replace a very large 18th century property which had once been a local office for the Plymouth-based newspaper, the Western Morning News (see the postcard view below right from c1910). The 1922 four-storey facade is constructed of a beautiful, honey-coloured limestone. Shallow, oriel bay windows with metal frames inset into the elevation rise through three floors. With such a strong vertical emphasis the building wouldn't have looked out of place in 1930s New York. 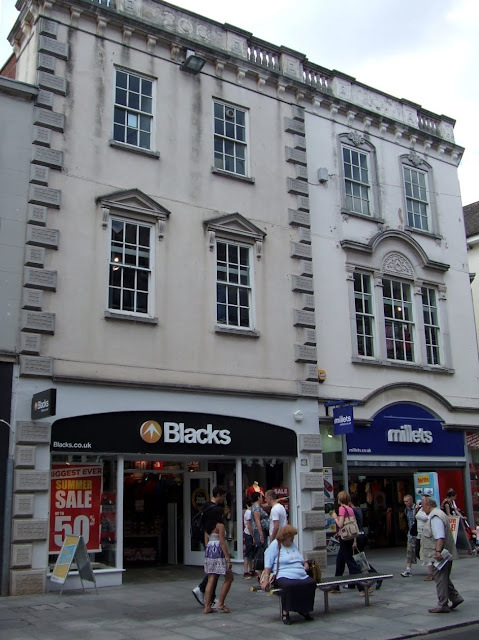 Despite their modernity, the oriel windows also echoed the numerous late-Elizabethan and Jacobean townhouses that still survived in Exeter at the time the building was constructed (for example, the former townhouse of the Earls of Morley that was located further up the High Street or the still extant Well House tavern in the Cathedral Close). Running from side to side at the top is a huge modillion cornice above which is the graduated Art Deco parapet. Fortunately the stone surround of the shop front has remained nearly intact. It's an impressive and unusual facade and makes a welcome addition to the surviving range of pre-war structures in the lower High Street. No. 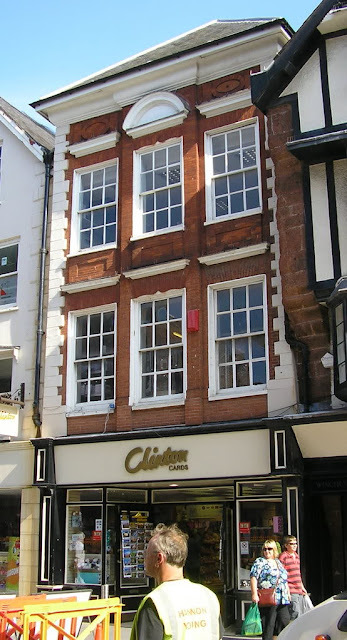 227 was built between 1660 and 1670, probably for one of Exeter's very wealthy cloth merchants, before being purchased by the city in 1733 in whose possession it remained until 1815. 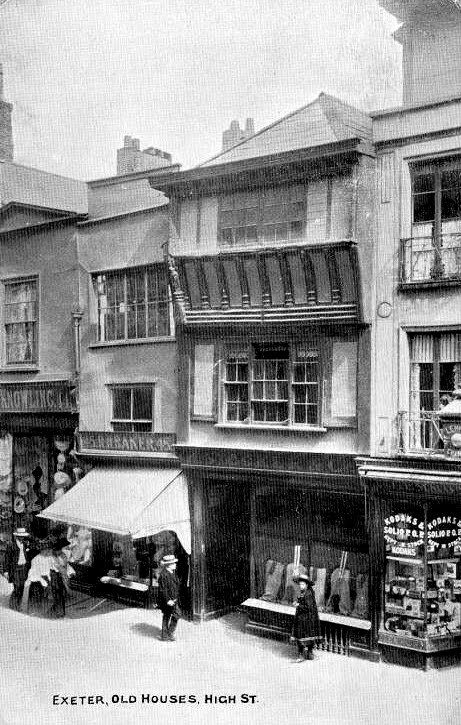 An advertisement for the property appeared in Trewman's Exeter Flying Post in 1842, along with the following description of the extensive accommodation: "a spacious shop, sitting room and show room, on the ground floor, with excellent cellars in the basement; on the first floor, two sitting rooms, kitchen and scullery; on the second floor, three bedrooms; and four bedrooms on the third floor. There is a good court behind, and the property has the advantage of a side entrance." By 1843 the building was occupied by the tailors and hosiers, J & G Ross, and the firm remained at No. 227 until the 1950s. Despite narrowly escaping destruction in the bombing raid of 04 May 1942, the local authority appeared determined to destroy the mid-17th century building. The first attempts to demolish both No. 227 and its 16th century neighbour arose in 1958 with a plan to widen the High Street, even though both buildings had received Grade II* listed status in 1953. Objections to the proposals rumbled on throughout 1959 and into 1960, when another application was made to have the properties removed followed by yet another in 1962. It is incredible that anything of the buildings survived considering the council's determination to demolish them. It wasn't until 1969 that a compromise was reached, but a compromise that was only one step away from total demolition. The plan involved the destruction of everything except for the facades of Nos. 226 and 227 and it was this plan which was eventually implemented in 1971, leaving just the heavily restored frontages still standing. All the rooms, the roofs and the other exterior walls were torn down and replaced with modern, open-plan retail space. The demolition took place without any archaeological record being made of the building, although some significant features were destroyed in the process. A passageway flagged in stone ran through the building to the rear. This was demolished. A mid-17th century mullioned, six-light window with ovolo mouldings existed in the rear wall. This was demolished. A substantial 17th century oak staircase with turned balusters remained on the second and third floors. This too was demolished, as was much of the original roof. And so as far as No. 227 is concerned, the only element worthy of consideration is the facade. Several commentators and historians have noted that the front of No. 227 is important as an example of a transitional architectural style which combines a traditional timber-frame construction with classically-inspired details. (A similar facade from the mid-1600s existed at 38 North Street until it was demolished in 1972.) Each floor is supported on brackets as they jetty out over the High Street. Both the first and second floors have continuous leaded windows stretching from side to side with a pedimented Ipswich window included on the first floor, either side of which are sections of oak parapet. Inset within the pediment is the coat of arms of the Merchant Taylors with two camel supporters, underneath which is inscribed the company's motto: Concordia Parvae Res Crescunt: (In Harmony Do Small Things Grow). The coat of arms, along with the sequence of heraldic shields below were all presumably added at the time of the 1878 restoration to mirror Ross's profession. The fourth floor features a four bay arcaded opening with more parapets and with windows behind. A further window with (dubious) scallop-shaped decoration above is set into the fifth floor gable end, which is also profusely hung with slate. Perhaps the over-riding impression veers slightly too much towards 'Swiss chalet' but it's difficult to know precisely the extent of the inevitable alterations which have taken place since the mid-17th century. The house underwent a major restoration in 1878, while still in the hands of Ross, and fortunately a report appeared in Trewman's Exeter Flying Post describing some of the process. According to the report the work carried out was "the first restoration in domestic architecture of the middle of the 17th century that has been made in the city". The article states that some elements of the facade had been "considerably marred by clumsy repairs and painting" but that "enough remained to indicate what should be replaced". The intention of the architect behind the restoration, T. Lidstone of Dartmouth, was "to embellish" the frontage "by replacing the old bold outline of the moulded work". The facade was repainted using traces of original paint left on the oak timbers for guidance and it seems the slated gable end was also totally renewed, as was much of the woodwork, including all the brackets. Both Peter Thomas and Hugh Meller describe the 1878 restoration as "careful" but, like its Tudor neighbour at No. 226, the frontage today looks disconcertingly new. The facade certainly wasn't helped when, in 1971, the shop front itself was swept away and the facade was jacked up onto steel girders allowing pedestrians to walk unimpeded underneath. Today the surviving facade of No. 227 lacks any context within a wider historic cityscape, surrounded as it is with 1970s redevelopment and sitting on the edge of the vast post-war reconstruction of the High Street below. Attractive though they are, the facades of these two buildings are totally fake, cast out of concrete in the 1970s, modified versions of the original frontages. Still, the reproductions were apparently good enough to fool the city council's own recent conservation report which stated that Nos. 206 and 207 "retain their attractive early 19th century facades", before adding that "they have been totally gutted as part of the Guildhall Shopping Centre development." They weren't just gutted. They were both razed to the ground, despite the fact that both buildings were granted Grade II listed status in 1974. Just five years later, in 1979, the two 150-year-old properties were totally demolished by the city council. Presumably moulds were taken of the facades prior to demolition. 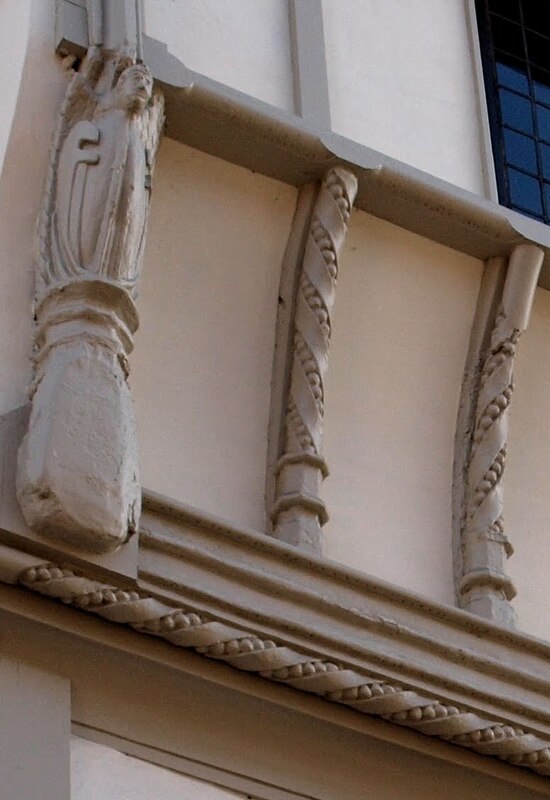 Concrete replicas were then cast and inserted onto the fronts of the new constructions. No. 206, shown to the left in the photograph at the top of this post, dated to the early 19th century. The original listing description suggested that the rendered front possibly concealed an older building but obviously none of this earlier structure remains today. The post-1979 facade differs markedly from the original. As it stands today the structure is on three floors with vermiculated quoins extending from ground level to the modillion cornice at the top, above which is a non-continuous balustraded parapet. 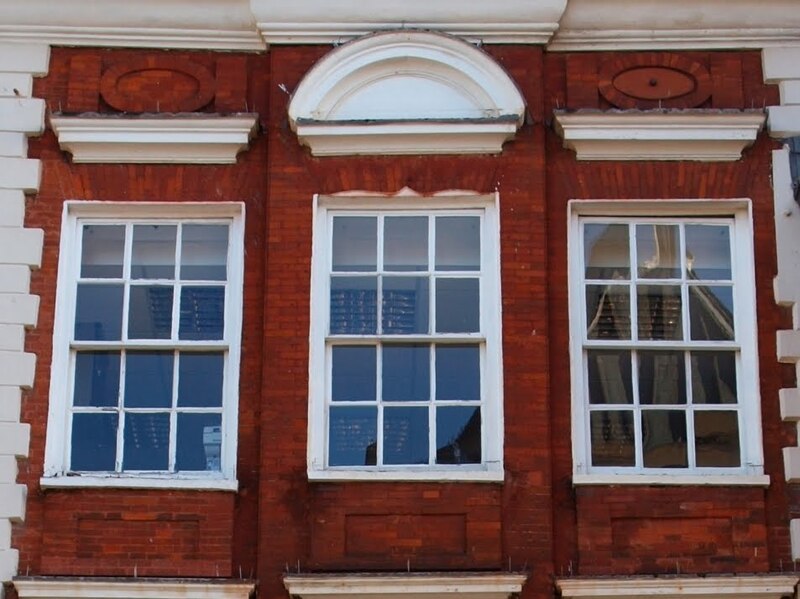 On the first floor, above the modern shop front, are two 12-light pedimented sash windows with two slightly smaller 12-light plain sash windows on the second floor. Before its demolition No. 206 actually spread over four floors. An entire floor was lost during the reconstruction, necessitating a reconfiguration of the layout of the facade. The two pedimented sash windows were still present in the original but were less tall, having only 8 lights each. The major element, now missing entirely, were five arched windows at first-floor level, each window separated by slim Doric columns above which was a dentile entablature. The photograph right dates to the 1960s and shows the five arched windows on the first floor of No. 206, the pedimented sash windows just visible above. The modillion cornice and the balustraded parapet were all part of the original, early-19th century facade but the current facade is a pale imitation of its predecessor, not helped by the dirty and stained appearance of the concrete from which it was cast. Standing on the corner of the High Street and the much-mauled Goldsmith Street, No. 207 High Street hasn't fared much better (shown to the right in the photograph at the top of this post). The original building was slightly later than its neighbour, No. 206, and seems to have dated to the mid-19th century although stylistically both buildings were very similar, sharing the same modillion cornice and balustraded parapet. 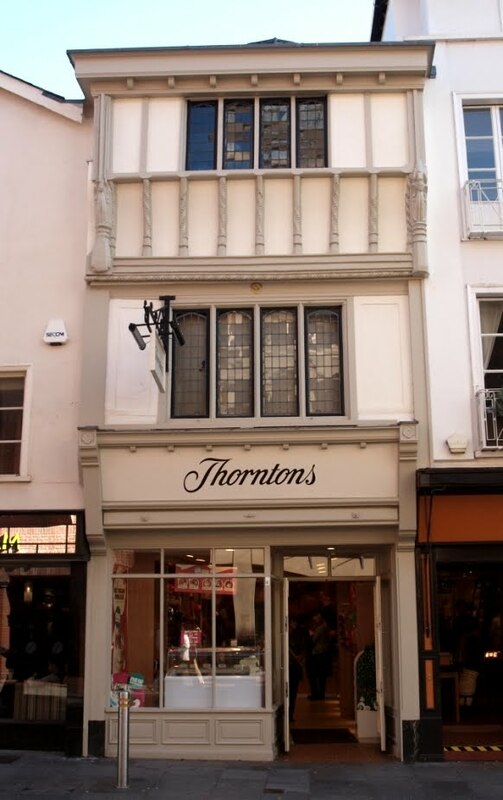 The facade that now looks onto the High Street is an almost exact replica of the original, the first floor dominated by a large Venetian window with a plain curved pediment inset with foliage details. 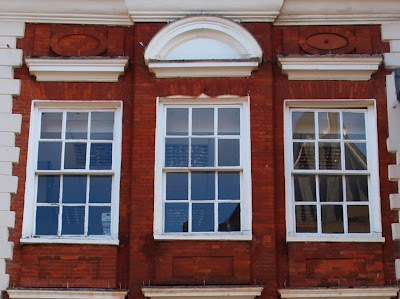 Each window is separated by square columns topped with bulls eye rosettes. The second floor has two sash windows with decorated architraves. The corner of the building is chamfered as it turns left, probably designed to ease the passage of horses and carts into what was for centuries the very narrow thoroughfare of Goldsmith Street (nearly all of which was also demolished in the late-1970s). The architrave around the first-floor window inset into the chamfer is a post-1979 addition although the second-floor sash window with decorated architrave is consistent with the original. The Goldsmith Street facade is now very different. 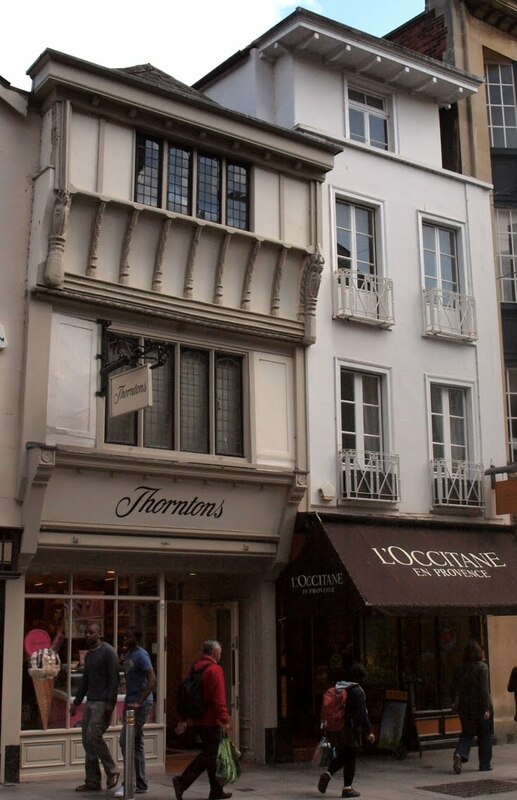 Before 1979 the facade was at least one bay longer with both a large twin sash window under a curved pediment and another Venetian window, similar in design to the one that appears on the High Street facade. Only the Venetian window was replicated in the reconstruction, moved from its original position to nearer the corner with the High Street. 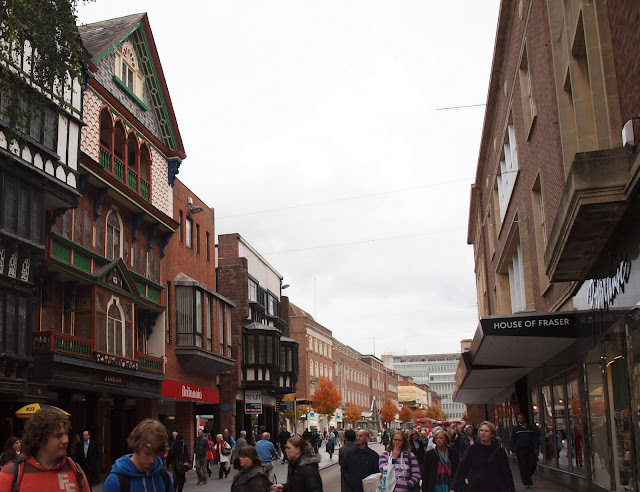 The replicated facades, even in their inaccurate and scruffy condition, are preferable to the majority of the architecture in the High Street, so it's diffcult to be too critical. 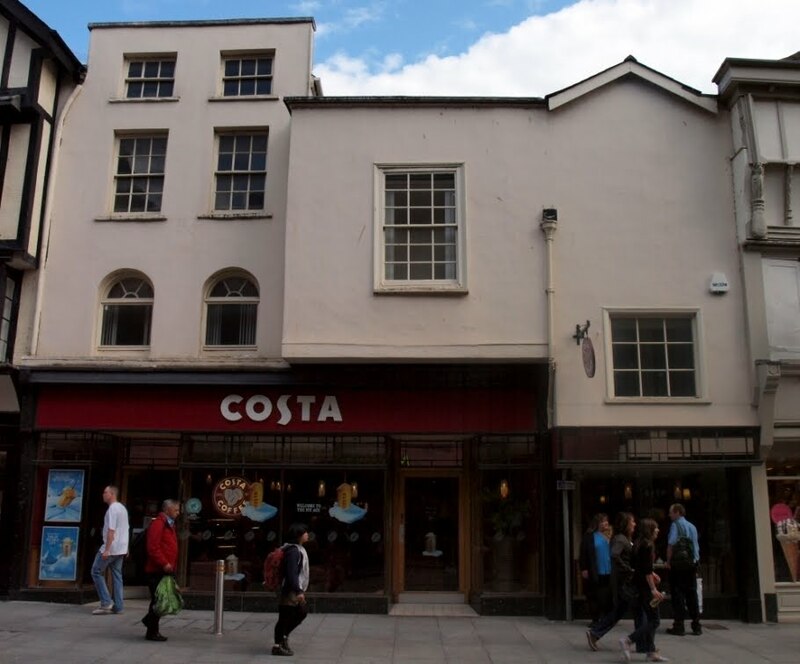 In a rare exception, the local authority made an effort to retain some semblance of Exeter's architectural heritage but the modified facades are now without any historical context, the buildings to which they once belonged having been destroyed. Both buildings are still on the national register of listed buildings but they should be removed. The postcard view of the High Street below dates to c1900 and shows Nos. 206 and 207 to the right of the Guildhall. 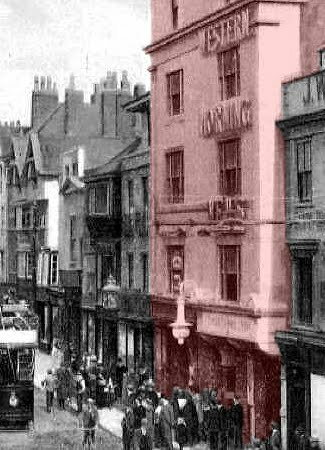 Apart from the Guildhall itself and the Turk's Head inn just visible to the far left, all of the buildings shown on this side of the High Street have since been demolished.